Erik L. Proulx specializes in medical malpractice litigation. 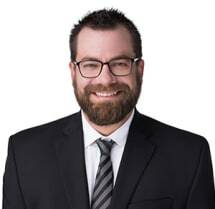 Mr. Proulx received his Bachelor of Science in Biology from Alma College in 2002 and his Juris Doctor from Thomas M. Cooley Law School in 2009. While at Cooley, he participated in an externship with the Washtenaw County Public defender in the Juvenile Division. Mr. Proulx is a member of the State Bar of Michigan and Michigan Association of Justice. He is also admitted to practice before the U.S. District Court, Eastern District of Michigan.